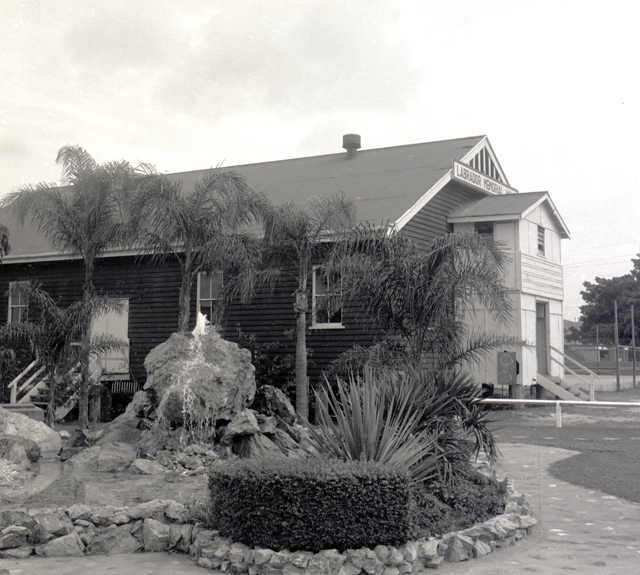 During the 1940s and 1950s the Labrador Memorial Hall was used as a venue for meetings, functions, receptions, roller skating, dances and movies. 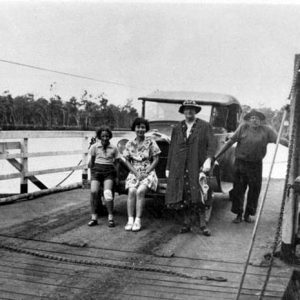 The Labrador Reserve for Recreation was originally selected by the Queensland Government Lands Department as a wharf reserve around 1870. 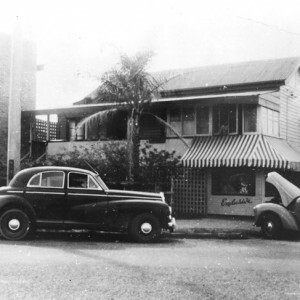 The reserve consisted of over five and a half acres of land opposite Harley Park on Marine Parade (formerly known as Brisbane Road) with the southern boundary located at Broad Street and the western boundary located at Bath Street. In the 1920s, local residents united to improve the reserve and, in 1928, the Lands Department accepted the proposal from the newly formed Labrador Progress Association to build tennis courts and a hall for community use. The Lands Department divided the original wharf reserve into two parts. One part (portion 85) was set aside for the Labrador Recreational Reserve and the second part was set aside for the Labrador Memorial Hall (portion 86). Mrs Emma Proctor and the women from the ladies’ committee of the association raised funds for the community hall through social dances held in private homes and the nearby Grand Hotel. The hall was intended to be a memorial to fallen soldiers of World War One and, when sufficient funds were raised, it was built under the supervision of Mr. Thomas Ramsay Hall (Brisbane) by Mr. A. Ledbury (Southport). The hall was officially opened on Friday 4 October 1929 with a floor space of 2,400 square feet and at a cost of £650. 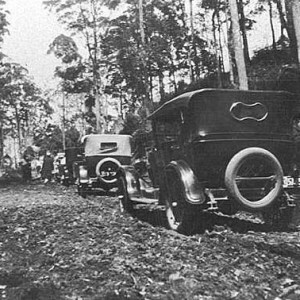 Many social and community events took place in the hall with one of the first celebrations being the annual end of year dance for the Labrador State School held in December 1929. During the 1940s and 1950s the hall was used as a venue for meetings, functions, receptions, roller skating, dances and movies. It became to be known as the Grand Theatre, not only because the movies shown on Saturday nights, but possibly due to its proximity to the Grand Hotel. The hall was also home to the Labrador Sunday School which was affiliated with St. Peters who provided the texts. Mrs Watts and Mrs Thrift were two of the Sunday School teachers during the 1950s and one of the challenges of using the multipurpose hall included the Sunday School reeking of cigarette smoke following the popular movies shown on Saturday nights prior to Sunday School. After a couple of years Canon Lindsay suggested the Sunday School become separate from St Peters. 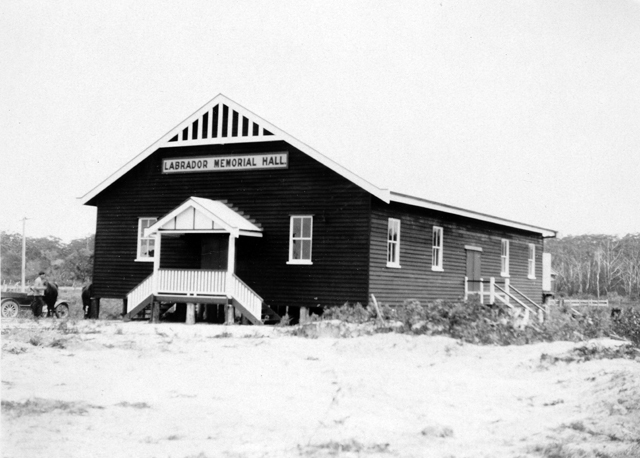 The newly independent Sunday School ended its association with the Labrador Memorial Hall and bought the old Gospel Hall on North Street and relocated the building to land they had purchased. 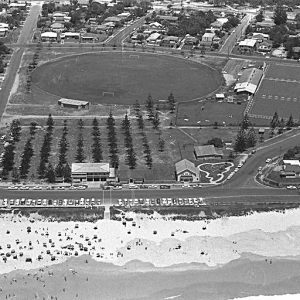 During the 1950s, the North Southport and Labrador Progress Associations were anxious to modernise the hall and increase its capacity to accommodate greater numbers of people and host larger functions. It was proposed to extend the main building to a depth of 84 feet and to add an annex on the northern side to provide stage and dressing room accommodation. While some improvements were made to the hall, no extensions took place. 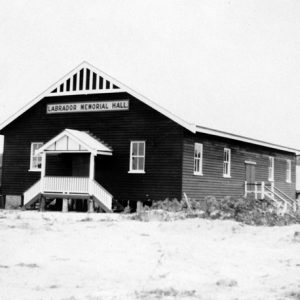 In October 1972, Alderman Denis O’Connell made an application to Alderman Ern Harley, trustee of the Labrador Memorial Hall, to remove the timber hall from its Labrador site and relocate it. 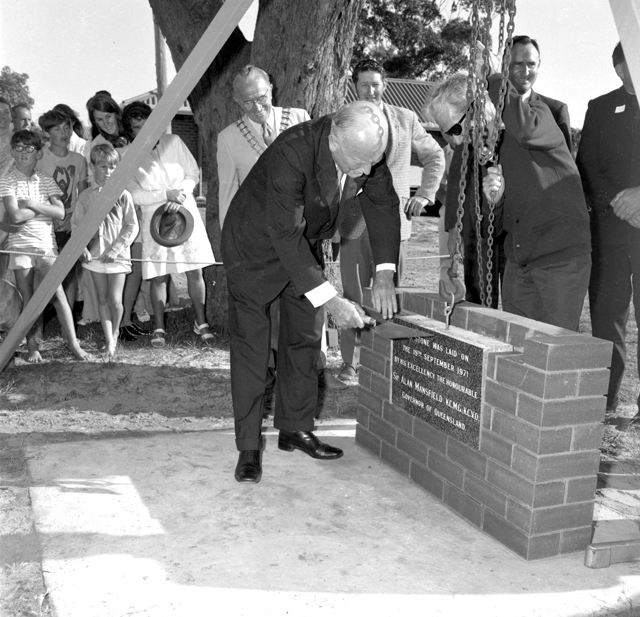 A new brick building was erected in its place and renamed the Labrador Memorial Senior Citizens Centre. 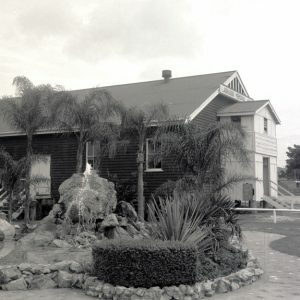 The original timber hall was transported to Owen Park, Southport where it became the home of the Southport Gymnastics Club and was subsequently extended. As of 2017, the former Labrador Memorial Hall was still is use as a gymnastics venue at Own Park. 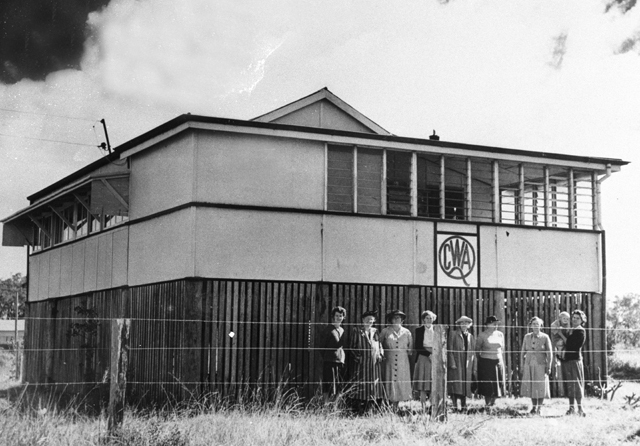 The recreation reserve adjoining the original hall experienced its own changes over the years. 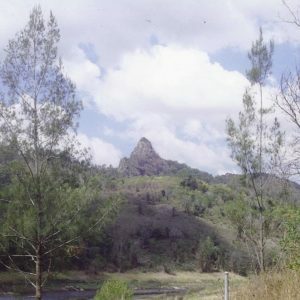 It was put to numerous uses including a cricket pitch, tennis court and camping site. 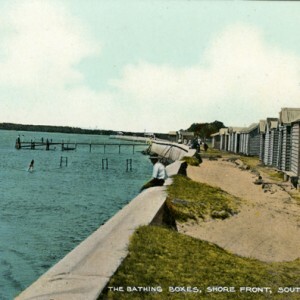 During the depression of the 1930’s, temporary huts were constructed by the Southport Town Council on the recreation reserve to house families in financial distress involved in the Intermittent Work Relief Scheme. The first group of ten workers and their families arrived in July 1931 and included 27 children, ranging from about six months old to 14 years in age. The men were engaged to work in the local area clearing and building roads, working on the Labrador drainage works and improvements on the Esplanade and seawall. On the day of their arrival, the families were welcomed with an afternoon tea in the hall hosted by the Mayoress of Southport, Mrs. C. H. Steadman, Mrs. J. White and ladies of the Labrador Progress Association. 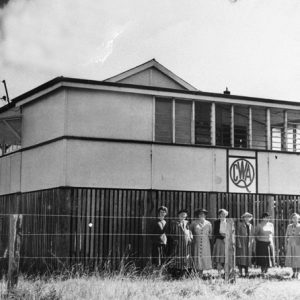 In the 1930s, the Queensland Country Women’s Association of Southport, having applied to the trustees of the Labrador Reserve, received land in Broad Street to build a seaside holiday cottage to be used by members of the association. The District Land Commissioner approved a special lease and two cottages on Stradbroke Island were purchased, transported and re-erected as one building on the land. The building was officially opened in January 1938 and, during World War Two, was used by the Army Light Horse Regiment. 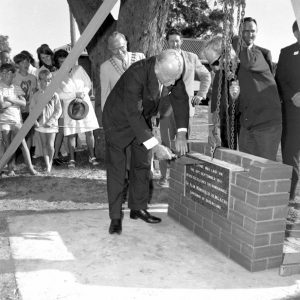 In 1964 a builders report condemned the cottage and tenders were called to demolish the building and erect a new brick building on the land. The new building incorporated a three bedroom flat upstairs and a one bedroom flat downstairs. It was still in use during 2017.